Join option: Allows to join multiple pst files by creating the new pst folder. Merge option: Facilitates to combine similar PST file into one. 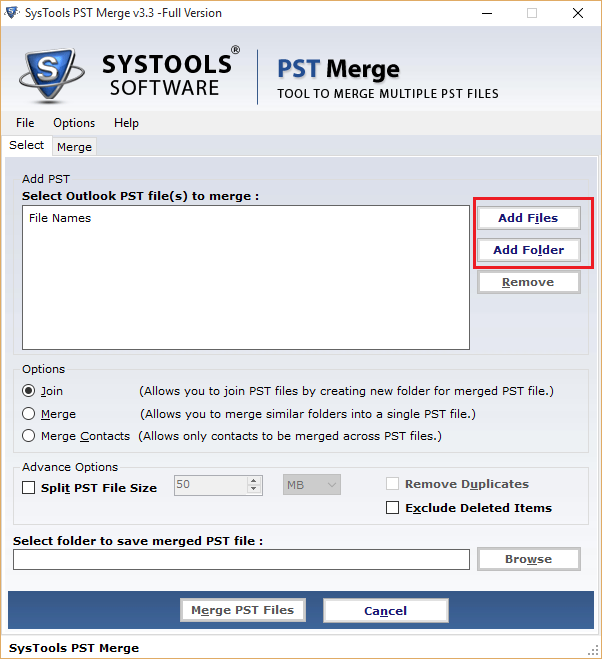 The Best PST Merge tool allows excluding deleted items folders while combining several pst files into one file. You have to use the checkbox to enable the functionality. By doing so, pst file merge utility will not combine deleted items folders into the resultant pst file. This helps to save crucial time and disk space. The PST File Merge Software provides the facility to merge pst contacts of multiple pst file into the single pst file. The contact list of each pst file gets concatenate into a single pst file. 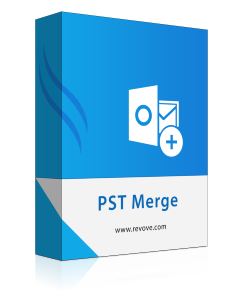 The PST Merger software maintains the meta properties of Outlook contacts like name, email addresses, contacts numbers, company name etc. The PST file merger software provides the ADD folder option to combine multiple pst file of any Outlook Version such as 2016, 2013, 2010, 2007. It will help you to add multiple pst files at once. You do not need to browse pst file one by one to merge pst file into the single pst file. The PST Merge Tool is compatible with almost all the versions of Outlook 2016, 2013, 2010, 2007 and 2003. The PST Combiner Software is smoothly run under the all the major windows versions such as Windows 10.1, 10, 8.1, 8, 7 etc. Demo version of PST Merge software has following limitation. Join PST Limit: Join only first 2 folders of each PST file. Merge PST Limit: Merge only first 15 items of each folder of PST file. Support: Windows 10.1 & All below Windows Operating System Version. Is there any option to merge only contacts of Outlook Data file? Can I combine corrupt pst files using the PST combiner software? Does MS Outlook installation is necessary for merging pst files? Does software support ANSI pst file also? Yes, Software supports ANSI PST file created by old outlook versions. What will be the format of the resultant pst file? The PST merge software creates the resultant pst file in UNICODE PST file format only. I have been using the Outlook for business communication. Recently I have created the archive file of my outlook profiles. I am looking forward to separating contacts from archived pst file. But I did not find any methods to do same. Then one of my friends told me about the PST merge software to which helped me the lot to merge pst contacts into the single pst file. The tool is technically brilliant and easy to use. Thanks for such nice software. Managing Multiple PST file is such a difficult task and time-consuming process. It needs the excess of tolerance and bear power to handle it regularly. I am in continuous search of a tool that helps me to merge multiple pst file into the single pst file. Luckily, I have found the PST Combiner software to combine several pst file into single pst files. It speedily performs the job for me without loss of data and original format. Thanks to PST Merger software to help me out from the sophisticated problem.